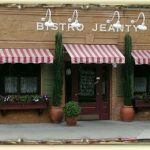 I’ve been to Bistro Jeanty twice, on 4/21/2008 and back on 4/2/2010. On my first visit we had a good bottle of wine, the mussels appetizer, a pork dish, a fish dish, fries, chocolate crème brûlée (great, and I am not such a big crème brûlée fan) and 2 coffees for a total of $131 including the tip. And all the food was excellent. On my second visit we had a sole filet, side of spinach, dinner size mussels (I didn’t like them this time), a glass of Blockheadia wine and a hot chocolate. We were eating light so this time it was only $81 w/tip. I was a tad less enamored with the food on the second time around, but it was still very good. And the service was excellent. My, now, wife asked for a fair number of substitutions and they were extremely accommodating — it isn’t usually easy to get french restaurants to substitute oil for butter. Also note, you can bring your own wine with a $25 corkage fee. Anyway, I plan to go back anytime I am near Napa.